Come one! Come all! Grab your hat and read with the Cat! Help us celebrate Dr. Seuss' 115th birthday! March 2 is his official birthday and is designated Read Across America day. 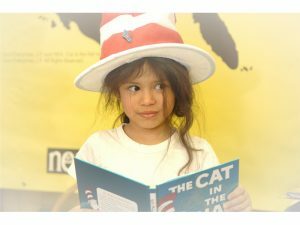 We will be joining in with classrooms and libraries around the country to celebrate reading and the world of Dr. Seuss. Of course we can't limit the celebration to just one day! There will be activities at all of the branch libraries spread out over a week. Join us for favorite books, crafts and more. No registration is required. Several branches will serve birthday cake at their event. Please call the branch for details. Please inform the librarian of any food allergies at least one week in advance. We are happy to make accommodations for you.